Gallop on horseback with herds of wild zebras and giraffes, or immerse yourself into a family of elephants as you explore the African wilderness with these highly intelligent creatures. Viewing wildlife perched high on the back of a horse or a camel is an awe-inspiring experience as wild animals are usually more relaxed when approached by other four-legged creatures. 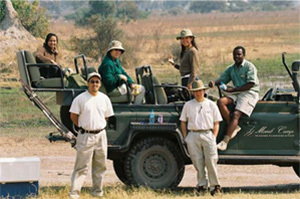 These activities can range from a couple of hours to a full-day or multi-day safaris for the keen rider. The main attraction of a horse safari is to be able to ride fit and well-trained horses over just about every terrain and landscape filled with wild game. 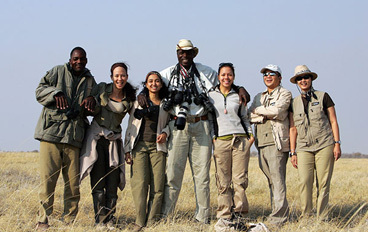 The riding is varied, sometimes quietly walking and following big game and admiring the bird life, sometimes cantering through open plains alongside galloping giraffe and antelope. Highly experienced guides will share with you their intimate knowledge of the African bush, using the horses to bring you closer to other animals and birds. Non-riding spouses and children can enjoy the many alternative activities including game drives, boating, walking and fishing. In northern Kenya, walking safaris using camels to carry supplies enables guests to travel in style in raw and relatively unexplored country. One or two riding camels are always available so guests can have their own epic Lawrence of Arabia style experience. Abu Camp in the Okavango Delta in Botswana offers an unparalleled opportunity to walk and interact with African elephants in a totally wild setting and transform your perception of elephants, wildlife and hopefully, your outlook on life itself. Here you can explore the bush with iconic elephants and get to know the personalities of each family member, from playful babies to precocious teenagers and doting mothers, all led by the sage, experienced matriarch. By the time you leave Abu, you will feel a special, emotional connection to the herd. We DO NOT support or arrange elephant-back safaris. We also DO NOT support walking with lions and lion petting activities.